We are looking forward to this year’s National Philanthropy Day on Thursday, November 8th at the Topeka Country Club when we will acknowledge the spirit of generous giving in our community. 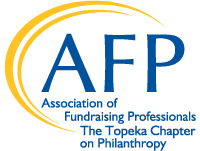 This year we will honor the memory and generosity of Philip and Betty Sisk when they will be recognized posthumously with the Association of Fundraising Professionals - Topeka Council on Philanthropy (AFP-TCOP) 2018 Philanthropic Leadership Award. In March, the Topeka Community Foundation announced receiving its single largest estate gift in the Foundation’s 34-year history when the Sisk Estate bestowed a $4.7 million gift to be invested and administered by the Foundation on behalf of seven non-profit organizations in Topeka. The Board of Directors of AFP-TCOP believes this act of benevolence deserves our highest award. We hope you will join us in acknowledging the Sisk’s vision, kindness and commitment to the arts, faith and social services in our community. David Callanan, Co-Founder of Advisors Excel will provide our Keynote Address. We will also recognize others who exemplify the gift of philanthropy with the following awards: Outstanding Volunteer Philanthropist, Outstanding Foundation, Outstanding Corporation and more. National Philanthropy Day (NPD) is a day set aside to rejoice in giving and to recognize exceptional individuals and organizations that make an impact in our community. Registration and networking will begin at 11:30 a.m. Our award program lunch will begin 12 noon. There are many sponsorship opportunities available for you to support this special event. Should you have any questions, please contact Lee Walker, National Philanthropy Day Chair at 877-530-5275 x1403 or email her at lwalker@kcsl.org.